Enjoy apple yogurt parfait for breakfast with a steaming mug of coffee. 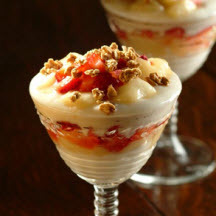 Layer yogurt, escalloped apples and strawberries in half of each 3 parfait glasses. Repeat layers. Top with granola. Refrigerate until ready to serve.